Nokia N900 - what's so great about it? Nokia has announced a new device that it hopes will keep it at the sharp end of the mobile industry, the Nokia N900, but what's so great about it? We delve under the bonnet of Nokia's latest handset and bring you all the things you'll need to know before deciding whether this is the model for you. Not necessarily something we agree with, but Nokia is adamant this isn't a phone. Instead, it's saying that it's a small computer/slimmed-down netbook (depending on who you talk to) thanks to the new Maemo 5 operating system (OS), which is based on Linux. Essentially, it's a unit with a 3G chip in it for voice and data with a similar form factor to a phone, so it's really just semantics what you want to call it. But the pivotal thing is Nokia wants people to see it as a computer, meaning higher-powered applications and a stronger focus on developing an ecosystem around the phone. As mentioned above, the new Maemo 5 OS is designed to offer powerful new options that we haven't seen on Symbian-powered devices before. While Maemo has been seen on previous internet tablets from Nokia, this release is important as it makes the OS more finger friendly than ever before. It also allows a high level of customisation, a wider web browser and more location based services too. It's built on Linux, meaning it's a much more open platform to play with and develop. The theory behind this is the developer community can really get their teeth into playing around with the possibilities of the N900, something which has served Apple and Android well in recent months. Nokia's been shrewd when thinking about what hardware to pack under the hood, going for the high end TI OMAP3 microprocessor with ARM Cortex-A8 core rather than the headline grabbing Snapdragon from Qualcomm. It's the same as that seen in the iPhone 3GS and the Palm Pre, but more importantly it's fused with 1GB of RAM and OpenGL ES 2.0 graphics acceleration. This means slicker application transitions, minimised slowdown and a wider array of possibilities for developers to play with. 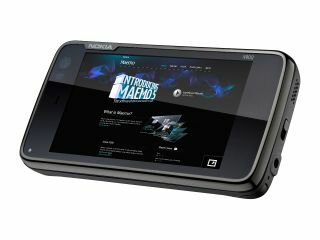 Another key feature of the N900 is the multi-tasking on offer thanks to the new Maemo OS. Of course, multi-tasking has been around for a while on the Symbian platform from Nokia, but this takes it to another level for seamless use. Not only does the new processor allow you to run a huge number of applications at the same time, the UI offers a one touch approach to seeing all your open programs at once. If you want to get rid of something, simply press the 'x' in the corner of the panel and it's gone. Admittedly, it's not as cool as the Palm Pre's cards system, flicking them away to shut them down, but the sheer number of applications you can have open together, and without slowdown, is very impressive. One of the surprising things about the Nokia N900 is the presence of a resistive screen (which means it works by ever so slightly flexing to make contact with a circuit, rather than working off the electrons transmitted by your finger). Given all Nokia's other touchscreens have been resistive it's not that surprising, but as the X6, announced at the same time, has the more advanced capacitive screen type, we'd have assumed Nokia would have put it on the N900 too. But the resistive effort is very, very good from the Finns, reacting in a similar way to a capacitive screen. And this means the phone can be used with a stylus - crucial for the Asian markets and a big help for spreading the popularity of the phone.